Jane and Bill are Fun In The Sun Weddings’ newest newlyweds! This bride and groom left their Cancun wedding with a suitcase full of seashells and chicken costumes. Jane and Bill met at work. He was the school counselor and she was a new teacher. Because they shared friends in common, eventually they too became friends, and the more they hung out, the closer they got. The rest is history. When it came time to propose, Bill decided that the Christmas season was perfect. He started the evening with dinner at the restaurant where they went on their first date. Then they settled in at home to watch a movie. Part way through the show, he got up to grab them drinks and returned to Jane sitting in an inconvenient spot for him to grab the ring box. So, he sat down on the floor, maneuvered around a bit, and then got on his knee. She said ‘Yes’ before he even popped the question! After Christmas, the bride-to-be and her mom went shopping for the perfect beach wedding dress. They both loved the third one she tried on, and after trying on a half dozen more just to be sure, they came back to her favorite. 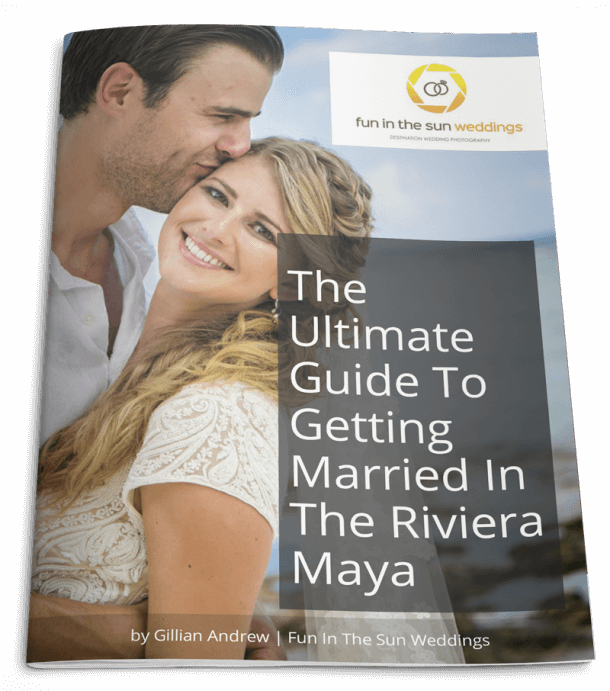 The bride and groom decided to host their destination wedding at the Finest Playa Mujeres because it is a beautiful resort with loads of great wedding details and amenities for their guests. Jane and Bill placed a huge priority on having fun with their guests. They chose to have a hot and sweaty mid-afternoon First Look photo session so that they could enjoy their own cocktail party after the ceremony. They brought down a suitcase of their own beach wedding decor from home: shells and starfish lined the sandy aisle at their beach wedding ceremony and made up the centerpieces at their reception. Mini Adirondack chairs had their guests’ names and table numbers. 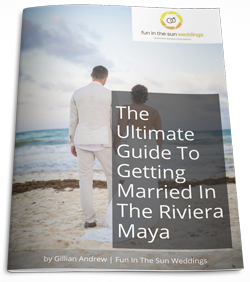 The guests had no idea this was all for them to take home as souvenirs, so the happy couple came to their Cancun wedding with a suitcase full of shells…and then went home with a suitcase full of shells! The bride’s favorite moment was their First Dance. Everything ‘official’ was over, the nerves were gone, and it was the beginning of the party. They had practiced a few times, but never to perfection, so they decided to just wing it. They had fun and enjoyed just being happy and in love. …and then out came the chicken costumes! Anyone who knows Bill knows that he is obsessed with chickens. And so, they became part of the wedding theme, alongside the pineapples that Jane loves so much! The dance floor was wild with thanks to DJ Disco Movil. What advice does the bride have for those who are getting married on the beach? What is most important in the end? Make that a guide, and the rest is just filler. You won’t really remember what the centerpieces were or what lighting you picked…you’ll remember the moments. So keep it simple and sweet. Don’t overwork yourself and just let yourself take it all in. Jane and Bill, it has been so much fun being part of your wedding adventure! We hope you always stay playful, and we wish you every happiness in your marriage. Congratulations! And if you are looking for the best Cancun wedding photographer for your beach wedding, then contact us today! We are Fun In The Sun Weddings, the best photographers in Cancun, Mexico. Want to know more about Finest Playa Mujeres resort? Read unbiased reviews on Tripadvisor here. Thank you again for all the amazing pictures! They are AMAZING!